I have a confession to make. No, I haven't eloped or tattooed anything ridiculous and regret-worthy on my derriere. I haven't robbed a bank, nor have I become a hugely successful underground belly dancer. My confession is actually nothing to be ashamed of: I grew up at the Jersey Shore. Ok, so maybe this isn't such a big secret. It's not like I make a conscious decision to not tell people where I grew up. I simply tend to avoid it, mentioning instead that I am Colombian on my mom's side, or that I lived in New York for four years before moving to England, where I live now. But the truth is I grew up in Lacey Township, a mere few miles outside of Seaside Heights. Yes, Seaside. The setting of The Jersey Shore television show and Snooki's countless, drunken escapades. It's the heart of Ocean County: the capital of tanning salons, teeth-whitening treatments, and muddy brown beach water. But hey — at least we have beaches. And we've proven time and time again that we can rise back on our feet after devastating natural disasters, like Hurricanes Sandy and Irene. When our boardwalk is in ruins, we re-build it, and we make it stronger. No fast food place, over-priced Starbucks, or bubble tea bar will ever compare to your WaWa subs and $1-milkshakes. And you'll never feel bad about going. No matter how ramshackled and gritty those diners might be. Just kidding! We get the oldest N.J. Transit buses, and drivers that couldn't care less if their recklessness results in passengers being trapped on a bus for five extra hours. Beach days have to start pre-dawn, otherwise you'll be stuck on Route 37 the whole morning. You can even get non-descript-beer-flavor. As in, they want to be fifty shades of orange. With every store on the boardwalk only further nurturing their needs. A lot of what you see on The Jersey Shore is pretty representative of life on Seaside Heights, but at least it's not representative of the entire coast. 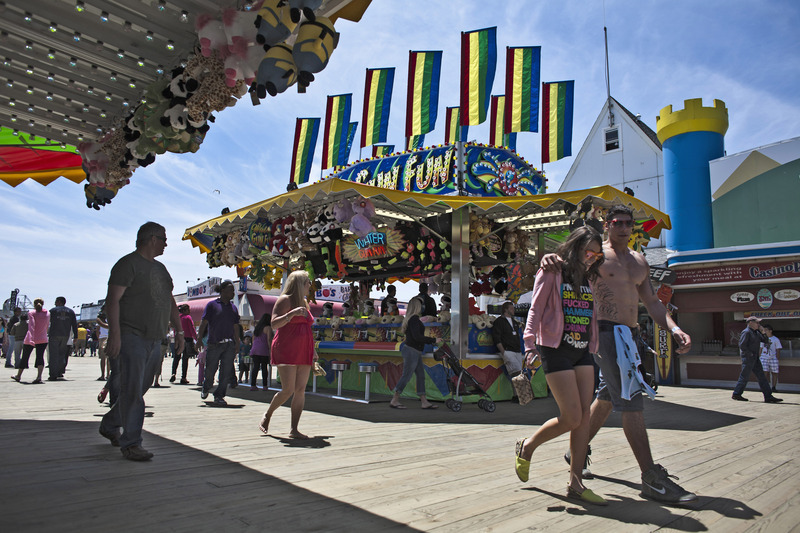 You feel compelled to go because what else is there to do, really, on the Jersey Shore? And who is actually going to pass up $2-shots? Me? No, no, no. I didn't mean me. So maybe this applies to all of New Jersey residents, but we're fundamentally opposed to it on the shore. But the abundance of drunken teenagers out for their prom weekends is usually too much to handle. L.B.I. is the best, quietest and most peaceful beach that the Jersey Shore has to offer. It's waters are still brown, but at least the setting is slightly more serene. She is the quintessential example of a shore resident. We take "casual" to whole new levels. But who can blame us? They are cozy and warm and pure works of Australian artistry. Because having a pseudo-monster truck is a first-class ticket to cool, don't ya know (vomits slightly in mouth). Best thing about the boardwalk: the 30-inch pies. Comfort food never looked so good. Known also as "heart attack on a platter" — but that's probably why they call it a "guilty pleasure."